We got to chat with the charming American Idol champ--before he hit the Manila stage--about his budding career, lasting romance, and who will win Season 10. Admit it: sometimes after a great live episode of American Idol, you just want to ignore the "You Cannot Vote" disclaimer at the bottom of the screen, and pick up the phone to attempt an international call. We tune-in not just for the great vocal talent, but also to swoon over hot musicians. And, nothing gets our hearts beating faster than a boy with pretty eyes, rich voice, and a guitar. 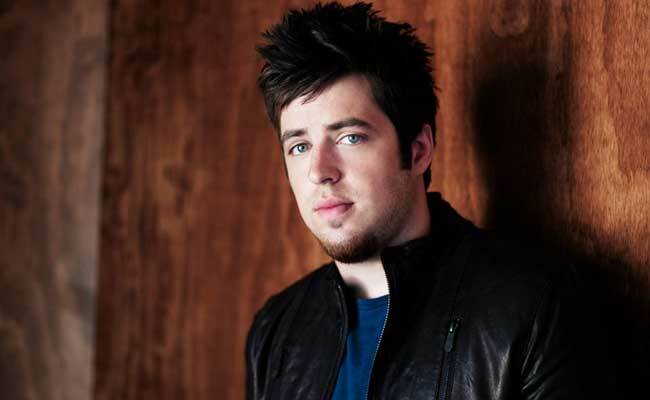 American Idol Season 9 winner Lee DeWyze is one of those charming artists who can both sing and compose. He visited Manila for a two-day show to promote his debut album Live It Up. Inspired by musicians like Dave Matthews, Ben Harper, Ray LaMontagne, Cat Stevens, and Kris Kristofferson, Lee created an album that tells compelling tales of relationships and all their ups and downs. Collaborating with well-known producers and songwriters (who have worked with the likes of Alicia Keys, Fergie, Bon Jovi, Kelly Clarkson, Beyonce, and Train) Lee co-wrote all but one song on the album. This cutie is the very first American Idol winner to have writing credit on a first single. "To see my name listed in the credits on each song was really important to me because I'm a songwriter," Lee says. "I also loved working with such talented writers. They all brought so much to the table and helped me flesh out my sound… I want people to relate to these songs." We got to chat with Lee for a bit during a press conference last May 7, Saturday, at the Eastwood Richmonde Hotel. It was Lee's first day in the Philippines, and he had just come from a performance on Eat Bulaga. He cheerfully greeted the press the moment he came in, wearing a blazer, jeans, and tsinelas (he's such a laid-back, down-to-earth guy). Before the interviews, he was given a miniature jeepney as a welcome gift, and he told us he'd love to ride one! Later that night, Lee treated his Manila fans to an unforgettable performance at Venice Piazza in McKinley Hill, and the following night at Eastwood City Open Park. He belted out songs from his album, like the lively hit single “Sweet Serendipity," “Beautiful Like You," "The Earth Stood Still" (which he smoothly replaced with "the Philippines stood still" toward the end), and his own acoustic take on U2's "Beautiful Day." Lee left his local fans screaming for more. We had several memorable moments in the presence of this Idol, and here are some excerpts from our Q&A with him. We've heard your old and new songs. You seem to have been more of a folk rock kind of guy before, but some of your new songs, like "Live It Up," are more pop. Did you have to make a lot of compromises while writing for Live It Up? I've always been one to write whatever I'm feeling. I don't think there's anything wrong with whatever's found…Whatever inspires you, just go with that, write with that. I don't want all my audience to become the same. I don't want every song to sound the same. I want variety; different music, different people to listen to me. I think that's more important. How do you feel about being compared to John Mayer? Well, John Mayer is a very successful individual, so to be compared to him, that's a compliment. For me, to be compared to other artists, it's an honor, precisely because it's cool that they look at you like that... I try not to think about that kind of stuff though. I mean, I want to make it, and I do my thing… The truth is, if you really love music, you'll listen to it, and you'll realize that, we're all different people and we all have our own style. Aside from playing the guitar, are there any other instruments you play? The drums were the first instrument I ever played actually. When I'd take them out and I'd also want to be able to sing, I would start playing and be like, "Wow, this really isn't an instrument where you want to be singing while you're playing." I also go to the piano and I’m able to dabble a bit. The piano's very good to me as far as songwriting goes. But, when it comes to the arrangement of what I play, the guitar is like…another limb. Everyone has their thing, and mine is I love to play the guitar. It's like there's a connection between me and my instrument, and I love it. Just how much have things changed for you, going from being a paint salesman to American Idol winner? Well, my clothes got a lot better! (Chuckles.) Definitely going from something I didn't love to do to something I've always dreamt of doing is a very big change in my life. Even when I worked at that [paint] store, I'd go in and I'd bring my guitar. I'd play it, and write songs, and play them for my co-workers. When American Idol came to Chicago and I saw the auditions, it was literally a last-minute decision. My friend was trying out, and he was like, “Hey man, you should try out too.” I was thinking, There are so many people, I've got work, the boss is going to be mad… But then I was like, "Why not?" So I waited in line, and the rest is history. Among the other American Idol finalists, to whom are you closest? Probably...Taylor Hicks. No, I'm just kidding (laughs). I mean, it's an amazing honor, since we've all gone through the same trip together, we've all had the same experience. We all didn't expect it—to climb that show and [for it] to be like a roller coaster from there on out. I feel like I've had the chance to talk to everybody. Kris Allen was great, he's a really nice guy… He's a songwriter, and I really respect him for that. And I've talked to David Cook as well… We all hang out and we can really relate to each other. Dave won, and Kris won, and it's a really cool thing. Who do you think will win American Idol this season? (Laughs) Oh, I know what you're going to say! ...do you have time for a relationship? Do you have a girlfriend? Yeah, I do have a girlfriend. Has it been challenging to maintain the relationship, with all the tours and everything else that comes with winning American Idol? Yeah, I think that, with any[one], whether it be your family, friends, girlfriend, it's hard to keep relationships… It can be difficult when you're alone. Even my parents, you know, at night when they're awake…they'd call and be like, "Lee? You want to talk?" It's just that they want to see me, and I'm gone for a couple of weeks. So it can be difficult sometimes, but I think that, at the end of the day, when you're close to somebody and you have a good relationship, it doesn't really matter how near or far you are. You can make it work. Click on the gallery to see some pics of Lee when we got up-close and personal with him at his press conference! Get a copy of Lee's debut album, Live It Up, which is now available in CDs at leading record stores under Sony Music.